Structure My Deal tools are complete — you're ready to visit BMW of Visalia! WHY ARE DRIVERS EXCITED ABOUT THIS YEAR'S BMW 6 SERIES? People around the globe have acknowledged that the BMW 3 Series is among the best small car automotive lines ever created. While the 3 Series began life in the racing world, it has grown to a cultural phenomenon. The 3 Series is consistently voted one of the best small cars on the planet - and for good reason. 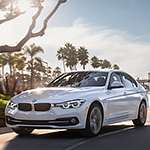 The 3 Series comes standard with a touring package that allows for a heightened driving experience. You are able to change the suspension on your vehicle to match your terrain - snow, gravel, rain, etc. The 3 Series also has some truly world-class safety features. These include anti lock brakes, parking assistance, lane warning departure, and many other features that make this one of the safest small cars on the market. Get a glance at the new BMW 3 Series. Visit our showroom in Visalia, California today!